Please ... what is "Galloper"? I'm suspecting Gneisenau. At first I thought it must be the name of a destroyer. It seems to me that Renown's turn at 05:12, presenting her beam to the fleeing Germans, might have been a mistake that ensured S & G's escape in that it opened the range. I strongly suspect though that it was an effort to reduce the effect of the sea conditions on her forward turrets so they could fire effectively. The Germans were running away and were not worried about their forward turrets being disabled by the sea, while their aft turrets could fire unimpeded. Renown was at times taking "green water" over her bows. Another thing I have learned from all this is that S&G did not escape because Renown was incapable of matching their speed - rather it was that matching their speed would have rendered Renown incapable of effective gunnery so she had to back off. It would be an interesting "what if" had the sea conditions not been so bad. Though the twins could still outpace Renown by 1 or 2 knots, that would have taken some time to achieve. Then with Scharnhorst's engine probems - that day might have been distastrous for the German Navy! As it were, luck was with them! Bgile wrote: Please ... what is "Galloper"? I'm suspecting Gneisenau. At first I thought it must be the name of a destroyer. Nickname for Renown! I'm not sure where she got it - maybe from her record setting voyage from the Indian Ocean back home in 1945 - showing she was still the fastest captial ship in the RN! I am glad that the map from Fechter/Schomaekers book was an help to support all your analysys. .... especilly with those particular terms. It is a pity that no photos nor film were taken, because I think that HMS Renown with the twin sisters on an engagement was something fantastic to see. 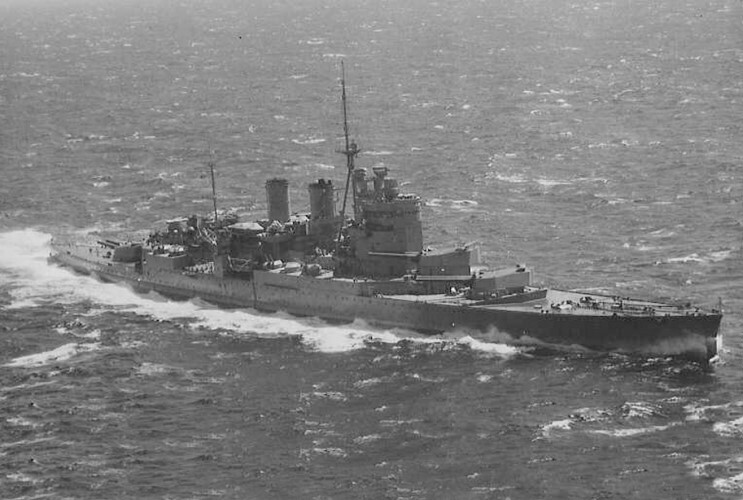 What type of camouflage was HMS Renown having on those days, ..... does anybody knows precisely her configuration ? Any photo available ? Scharnhorst and Gneisenau should be an easy one to determine, it was Op. Weserubung phase 1, .. so yellow top turrets on both. Antonio Bonomi wrote: What type of camouflage was HMS Renown having on those days, ..... does anybody knows precisely her configuration ? Any photo available ? In the early years of the war Renown was in a standard all grey paint scheme - I think Admiralty medium grey (AP507B) with her wooden decks unpainted and her steel decks in AP507A (dark grey). This was kept until early 1941 when her hull was darkened (AP507A?) with her superstructure remaining medium grey which was her scheme for the Bismarck action (same scheme for Ark Royal & Sheffield). Her first disruptive camouflage scheme came with her August - November 1941 refit. On a ’calm’ day it would not be S&G that were in trouble, Paul, as this would have made German artillery less affected by external conditions. As it were, during the duel, the Galloper had to face one capable Scharnhorst whereas the other fought against failures and breakdowns. So forth, once sea state is relaxed you may as well double the effect of German artillery. Conditions favourable to those ‘wet’ ships would not necessarily be a good thing if you’re aboard H.M.S. Renown. I’d say her end of the rope was not so bad after all. 0447 hours: Speed 12 knots. 05:07 hours: Gneisenau open fire immediately after H.M.S. Renown open fire. 05:10 hours: Scharnhorst open fire. 05:15 hours: 114 mm hit at Anton turret ear, with immediate flooding. 05:25 hours: 380 mm hit at foretop. Senior gunnery officer, two officers and three men fallen. This map contradicts my sources on some point. K/S use KTB extracts but clearly these do not comply with the timeline drawn at this map. Lutjens log does comply with speed set at 04:40 hours and 04:47 hours and also the reported radar contact at 04:49 hours but at a bearing of 295°. At 04:57 hours Lütjens log state visual contact made at bearing 260°. Timeline of the map state that H.M.S. Renown opened fire at 05:07 whereas Gneisenau replied immediately after. However Gneisenau KTB state that muzzle flashes was observed at 05:05 hours and that fall of shot was then spotted 300 – 500 metre distance abeam of Gneisenau’s bridge. Lütjens and Gneisenau log state that Gneisenau opened fire at 05:11 hours – four minutes later than stated on the map. At 05:07 – 05:08 hours both Gneisenau and Lütjens log state that fleet order helm 40° onto course 350°, which contradict the initial bearing on the map - 330° … unless Gneisenau made any turn between 04:40 hours and 05:07 hours which is not mentioned in their logs. The map does show the two turns at 05:08 hours and 05:13 hours but the third turn comes up at 05:23 hours whereas Gneisenau log state that fleet ordered helm st.bd. 60° onto course 030° four minutes earlier, at 05:19 hours. The reported time of the foretop hit at the map is set to 05:25 hours whereas Gneisenau log set it to 05:16 hours. Lütjens log does however comply with the map as his entry of the hit was made at 05:25 hours. The map is the first source I’ve seen that provide a time of impact for the 114 mm projectile landed at turret Anton. In Gneisenau’s log the crew men of the turret reported flooding as late as 05:34 hours. Lütjens does not mention it before that either. Your inputs are, as usual, appreciated. paulcadogan wrote: It seems to me that Renown's turn at 05:12, presenting her beam to the fleeing Germans, might have been a mistake that ensured S & G's escape in that it opened the range. I strongly suspect though that it was an effort to reduce the effect of the sea conditions on her forward turrets so they could fire effectively. IIRC, one of Renown's bulges partially separated forcing her to slow down. dunmunro wrote: IIRC, one of Renown's bulges partially separated forcing her to slow down. That's quite correct Duncan. 30 feet of her starboard bulge separated and cocked off at a 90 degree angle creating "a terrible second bow wave". But she still worked up to 29 knots for a short time despite this. Terje Langoy wrote: On a ’calm’ day it would not be S&G that were in trouble, Paul, as this would have made German artillery less affected by external conditions. As it were, during the duel, the Galloper had to face one capable Scharnhorst whereas the other fought against failures and breakdowns. So forth, once sea state is relaxed you may as well double the effect of German artillery. Conditions favourable to those ‘wet’ ships would not necessarily be a good thing if you’re aboard H.M.S. Renown. I’d say her end of the rope was not so bad after all. Sure Terje, the math is obvious. S & G handled aggressively would have been a tough prospect for the lone "Galloper", as they could have been for the Ramillies and Malaya respectively in 1941. I guess I'm thinking in terms of S & G running away from any opponent that packed a punch - so in a prolonged running fight there may be the chance of Renown scoring a disabling hit on either of them - more likely than them scoring a disabling hit on Renown (1900 lb 15-inch vs. 670 lb 11-inch). But that's a big "what if". Now on to more important stuff... our quandary of the contradictions will be difficult to resolve. The timing issue reminds me of the D/S battle in which most of the British accounts have Bismarck replying immediately to Hood's first salvo rather than 3 minutes later. This case is tougher since the contradictions seem to be coming from the same side. I wonder if Antonio has any info on the sources used to create the battle map. If Gneisenau's turret crew reported flooding later at 05:34, then maybe the 114 mm hit should be placed at the later time and the foretop hit earlier. I think this is quite compatible with the relative positions on the map at those times (i.e. Gneisenau's superstructure should not have blocked the turret hit especially given the high trajectory of the 4.5 -inch shell at that range). We must take into account the weather and light conditions on Luetjens decisions. The weather was foul to say the least and the visibilty was very poor. Luetjens wasn't sure of the exact composition of the British forces and he had to consider the possibility of a much stronger force just out of sight. His radar would have started to reveal the additional British destroyers as the range closed, but this would not have told him what they were. Since the Germans were to the eastward and the Renown and the destroyers to the westward, the Germans were highlighted by the eastern glow of the rising sun, while the British remained partially, or a lot, shouded by the darkness and gloom to the westward. This was a very dangerous situation for the Germans, and in my opinion Luetjens did right here. The Gneisenau was fighting boldly and well just prior to loosing its radar. many thanks for the very nice photo of that fantastic ship that HMS Renown was. It is very easy to pass to meters and make the conversion, by just by adding 2 zeroes, .... so 190 hm = 19.000 meters. They use enemy bearings NOT on real azimut but versus the 0=360 that is their ship bow while 180 is their ship stern, 90 and 270 the beam, while sailing this is dynamically changing versus real azimut. So you always have to know precisely the German warship course on that precise moment before being able to realize the enemy real azimut bearing. You must sum up their own course to the bearing of the enemy to be able to realize real azimut bearing. Because the enemy baering changes if the German warship course change, .... even if the enemy is alway there on real azimut. Royal Navy uses real azimut both for their course and the enemy bearings communication to the artillery officers, so 0=360 in North, 180 is south 90 is east and 270 west. Kriegsmarine used real azimut like RN above only for their own course communication. For the enemy and artillery communications everything is relative to their ship vertical axis as said above, so relative to their real sailing direction and not absolute reference to azimut. Dave Saxton wrote: This was a very dangerous situation for the Germans, and in my opinion Luetjens did right here. The Gneisenau was fighting boldly and well just prior to loosing its radar. No doubt Gneisenau was doing well - after all she hit Renown with her third ranging salvo. But the German ships were constrained by orders which forbade them from engaging an enemy of equal or greater strength - and a single Renown (or Ramillies or Rodney or Malaya) more than qualified. Luetjens was not going to stick around to press his luck. Had he done so and one or both his ships received serious damage, even if they subsequently got away he probably would have faced very sharp criticism. In one respect, he did succeed in drawing Renown and her destroyers away from other German forces (those going in to Narvik?) - later Repulse too - and so fulfilled in a way his "covering" role. I'm not sure what you're saying about bearings applies to the Red and Green bearings used by the RN. My understanding - and I stand to be corrected - is that those refered to bearing relative to the ship's heading and were used as a quick measurement so observers could know imediately where to look. The precise azimuth as you said would be used for other purposes. I'm not sure what you're saying about bearings applies to the Red and Green bearings used by the RN. My understanding - and I stand to be corrected - is that those refered to bearing relative to the ship's heading and were used as a quick measurement so observers could know imediately where to look. The precise azimuth as you said would be used for other purposes. is correct, .... as it should be of course because your clear explanation and the logic confirms it, ... it is my turn to stand corrected my friend . On Denmark Strait battle I have never found those RED and GREEN quick reference bearings you refer to but always the real azimuth ones ( i.e. 337 while on course 280 and not 57 ) and that is why I thought that they were doing differently. In marine navigation, starboard bearings are 'green' and port bearings are 'red'. Thus, in ship navigation, a target directly off the starboard side would be 'Green090' or 'G090'. This method is only used for a relative bearing. A navigator on watch does not have always have a corrected compass available with which to give an accurate bearing. If available, the bearing might not be numerate. Therefore, every forty-five degrees of direction from north on the compass was divided into four 'points'. Thus, 32 points of 11.25° each makes a circle of 360°. An object at 022.5° relative would be 'two points off the starboard bow', an object at 101.25° relative would be 'one point abaft the starboard beam' and an object at 213.75° relative would be 'three points on the port quarter'. This method is only used for a relative bearing. Yes the "Green" term was used in the Bismarck chase. Able Seaman Newell on Suffolk yelled "Ship bearing Green 140!" when he sighted Bismarck and Ted Briggs reported hearing "Alarm starboard! Green 40" when Bismarck was sighted from Hood. (I'm not sure how accurate his recollection was, as B & PE were more than 40 deg off Hood's bow when first sighted). And here, Renown said the hits she received came in from approximately Green 90 - straight abeam. I truly must apologise for confusing you with my continuous errors on bearing and course. Things do not always come out the way they are supposed to and I usually notice these errors when it’s too late to do anything about them. Concerning methods used to make a bearing: the Germans decided to run with the full circle whereas the British brutally cut it in half and mounted lanterns on the two pieces. Not a bad idea really! Green/red bearing reference was in frequent use when I wore blue colours. During transit and I was ‘on the clock’ my job was either as lookout on the bridge or standing guard by the life buoy aft. As lookout on the bridge I had to notify the officer of the watch of all things spotted, this being other ships, light houses, buoys etc. This was always called in using reed/green bearing. Buoy, green 30! Ship, red 90! They were of course never exact bearings; I was not particularly accurate unless it was hard to spot at once; a large tanker during broad daylight did not need the same accuracy that a little buoy on a fish net would require. I do know this is all theories at best but it does fit together with Antonio’s battle map as well as German logs though ONLY AT SOME POINTS – well, it gives at least a plausible sequence. Downside of those theories is that H.M.S. Renown then never did steer course 080° and hauled right round at 0459 hours, as stated by David Brown and Peter Smith, but instead turned due north shortly after spotting the German ships, at 0440 hours. I fear the essential nutcracker to this little mystery would be the log of H.M.S. Renown. With you all the way Terje... If only Renown had a website like Hood's! More on bearings - A German relative bearing of 250 degrees would have been British Red 110 (70 deg off the port quarter).